Thurs is watering day which is 3 hrs of shifting water hoses/sprinklers around the front/back garden every 30 mins- cut off time 10am. In theory, that mean I have time to beat the oppressive heat that is Central Texas. But I am lazy! 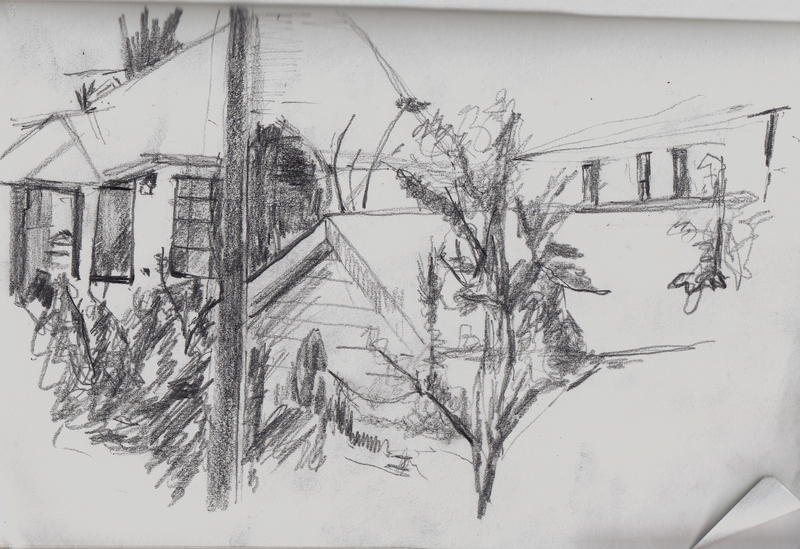 So I am indoors today looking out over our back garden for today’s sketch. 4.15pm Really need to work on prespective then trees blocking the view wouldn’t be such a challenge. Not a good sketch! As I was working on this at home in the comfort of air conditioning, I should have been able to work on this longer but I just found it frustrating. One thing was the faux window frame would shift all the time. I hadn’t realised that I move my head so much. Its a wonder I can draw anything with such a wobbly head. And then trees! Just have no idea how to tackle these. And again perspective. I have books on this subject but have yet to master it. Practice practice and more practice. Can’t believe I have actually managed to do 15 sketches since 1st August. That is a record for me and I aim to keep it up.